Where: Urban Fitness Studio, 1 Collins Road, Leamington Spa, CV34 6TF. 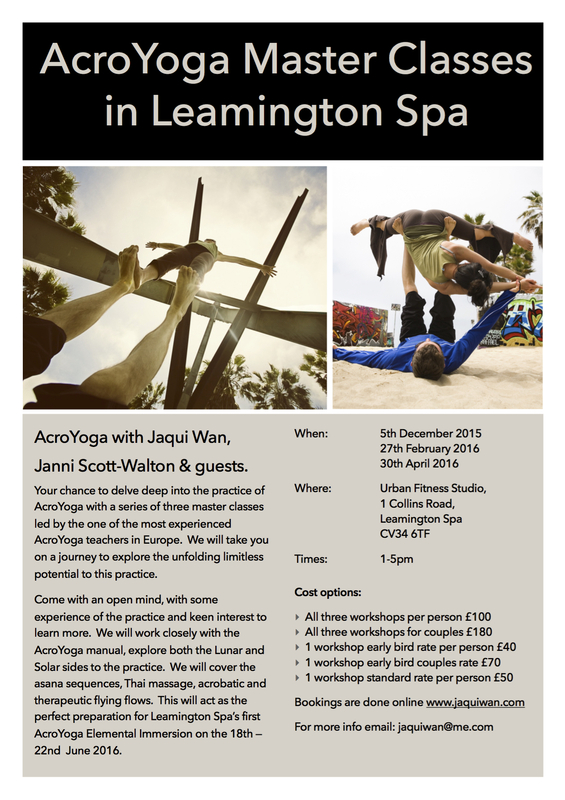 Your chance to delve deep into the practice of AcroYoga with a series of three master classes with Jaqui Wan, Janni Scott-Walton and a series of guest teacher to bring you a team of experienced yet playful teachers. We will take you on a journey to explore the unfolding limitless potential to this practice. Come with an open mind, with some experience of the practice and keen interest to learn more. We will work closely with the AcroYoga manual, explore both the Lunar and Solar sides to the practice. We will cover the asana sequences, Thai massage, acrobatic and therapeutic flying flows. This will act as the perfect preparation for Leamington Spa’s first AcroYoga Elemental Immersion on the 18th — 22nd June 2016. Booking for this series of workshops can be done via PayPal. If you do not have a PayPal account please email me on jaquiwan@me.com for alternative payment options.